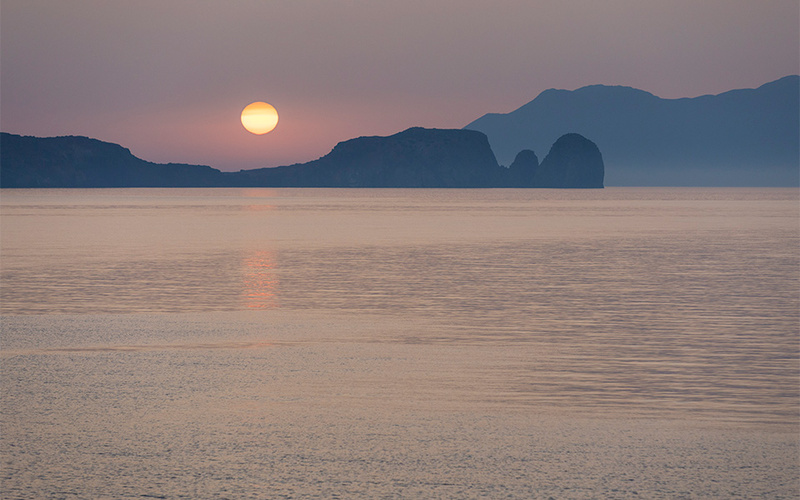 This island, sculpted by volcanic eruptions and time, remains relatively untouched by mass tourism. 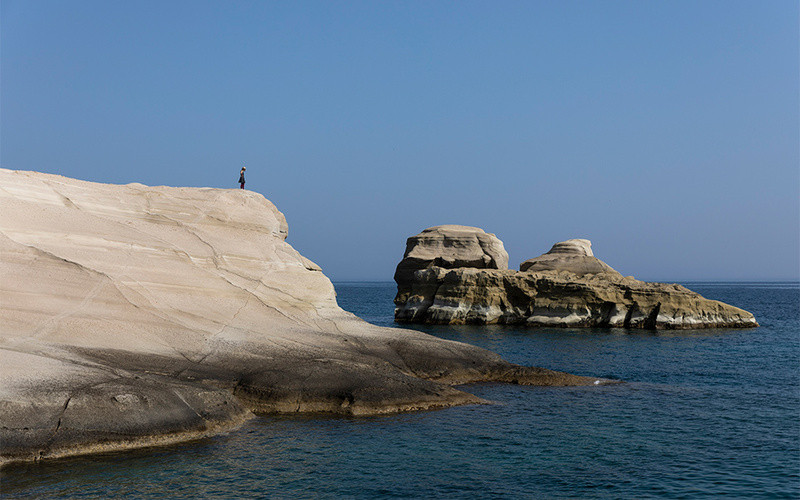 On Milos you spend your day like a pirate, moving from cove to cove, and later climb into bed feeling deeply satisfied. The island has only a few bars, and nobody minds. Here you will graze your knees climbing on rocks that change colors every few meters, you will cook in caves, you will see human and animal forms in the impressive geological formations, and you will doubtlessly find your own secret beach on which to sunbathe in solitude – perhaps without even a swimsuit. 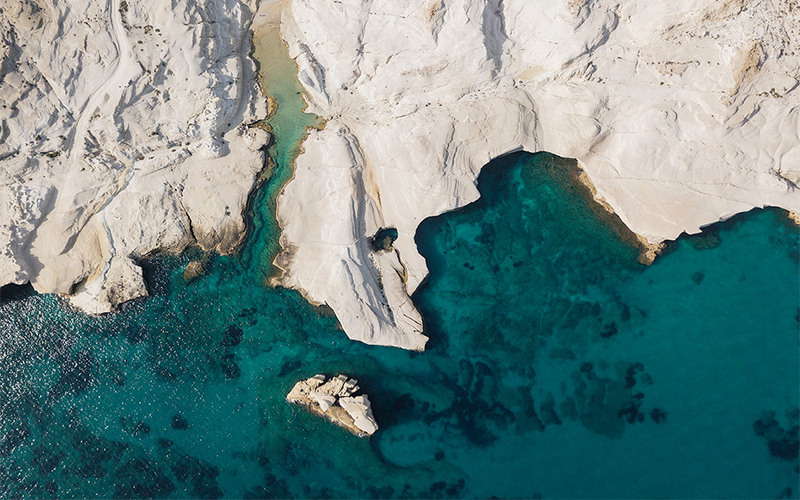 Milos is an entirely volcanic creation, built over eons by successive underwater eruptions. There are spots where the sea becomes a natural jacuzzi, with warm gases bubbling up from the seabed. Elsewhere, the sand on some beaches is so hot that it is impossible to walk barefoot. In Paliochori, on the southwestern part of the island, Stella Tseroni, the owner of the taverna Sirocco, places a Dutch oven in the sand in the evening and the next day has slow-cooked meat or fish ready for her customers. On the renowned beach of Sarakiniko – again a landscape reminiscent of those in the film Zabriskie Point and one where you won’t know whether to lie down or jump and frolic like Antonioni’s young protagonists – you will see the fossils of fish and shellfish that lived 2 million years ago. 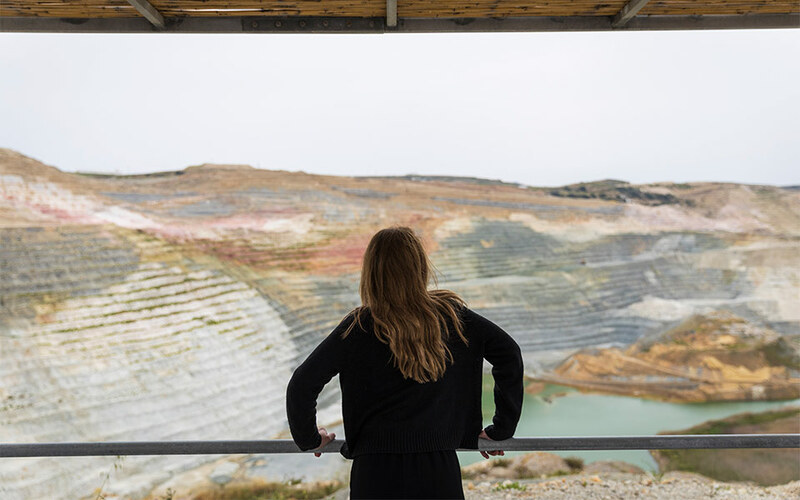 Milos’ geological wonders are fully revealed by a trip around the island by sea: you will pass by the dramatic landscape of Vani with its massive, deep red rock formations and where, until 1920, a manganese mine operated. 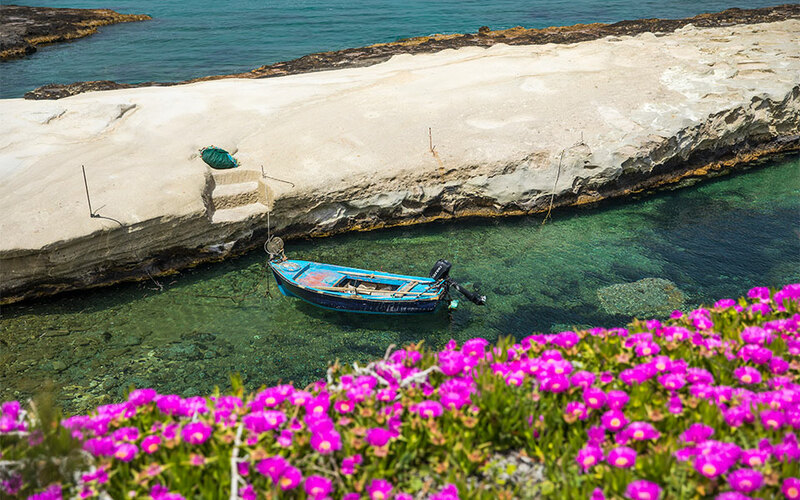 You will also visit the famed Kleftiko, with postcard-perfect white rocks lapped by turquoise waters, the narrow coves once the lairs of pirates. 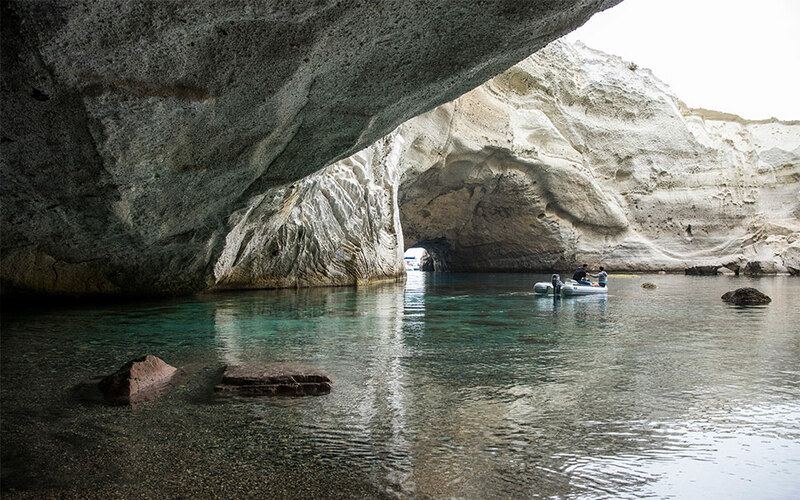 Taking this excursion on the catamaran of Milos Adventures we also stopped at the cave of Sykia, entering deep into its interior with an inflatable boat and lying on a small private beach looking up at the sky through the gaping hole left by the collapsed roof. Indeed the company also arranges private barbecues here by appointment. Alternatively, you can take a tour around the island, or go another route of your choosing on the traditional sailboat “Thalassitra”, or via kayak with the geologist Rod Feldtmann as your guide (www.seakayakgreece.com), or go fishing on the caique of Kyriakos Haldaios (www.milosfishingtrip.gr) who organizes super fishing excursions together with his daughter. 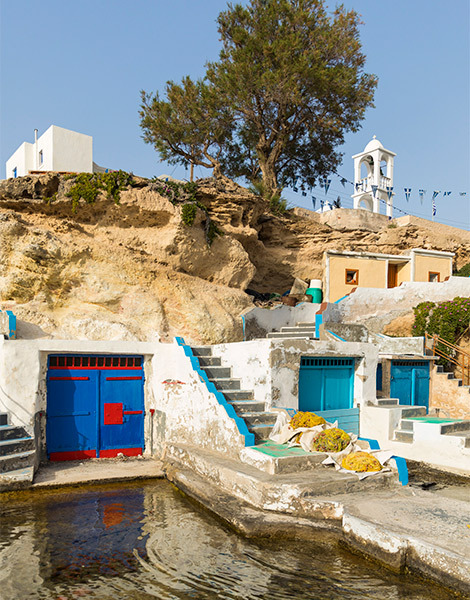 The colorful "syrmata" boathouses in Klima on Milos. 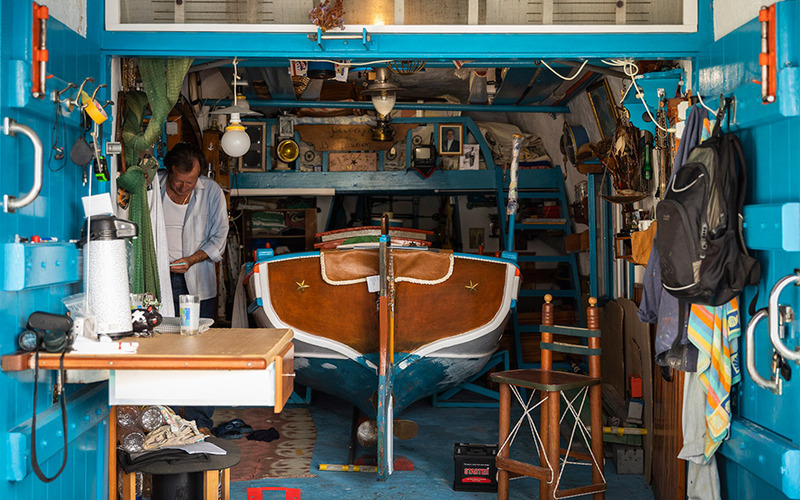 Fisherman Kostis Palaios spends his summer in a house that looks like a boat. It is literally on the water and from the “bridge” (i.e. his balcony) we can see children playing on a beach. He invited us for lunch and to see up close one of the syrmata – the colorful boathouses dug out of the rock where fishermen store their boats in the winter. In the summer, they are converted into refuges for midday siestas with a rudimentary kitchen and mattress, or into complete summer homes with all of the basic comforts for their owners, who are mainly local fishermen. The majority of the syrmata continue to belong to the locals as their title deeds cannot be sold – they can only be given for longterm leases. As such, foreign visitors who want to stay in them for their holidays usually rent them. Cleaning and gutting two barracudas in the shallows, Palaios recalls the 1960s, when, with basins, they would wash even their dishes in the sea. “Only Ava dish soap created a lather. We would cook, we would sleep all together on a tavloto [a makeshift bed made of wooden planks extending wall to wall] and we would go to the bathroom… in the mountains,” he says. Today they have solar panels which provide extra electricity. 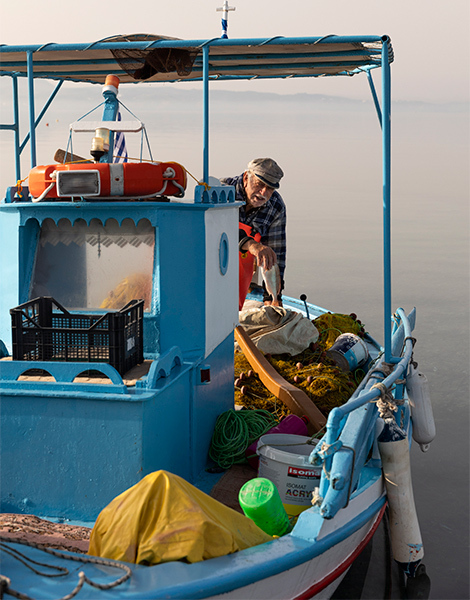 A fisherman from Milos enjoys a becalmed sea. 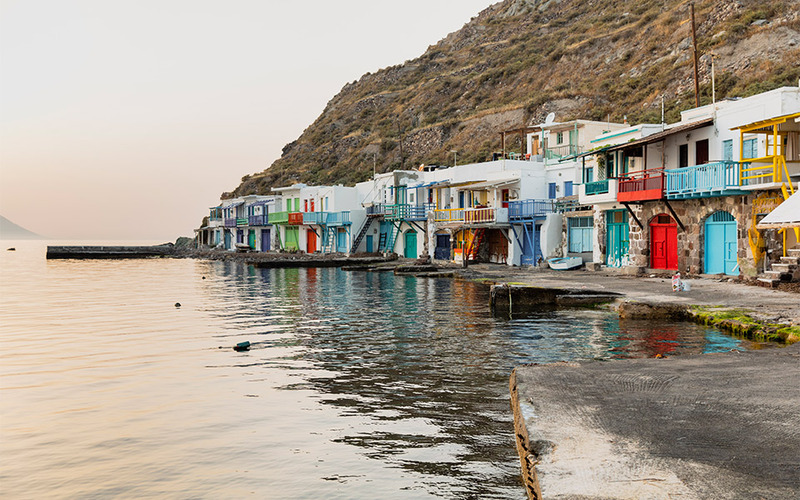 When asked why these buildings, which date to before the 20th century are brightly colored, there are two answers, says the president of the Municipal Port Fund of Milos, Nikos Xenakis. Their bright hues were either inspired by the multicolored rock layers of the island, or they were painted in order for each fisherman to be able to easily identify his home when returning by boat at night. 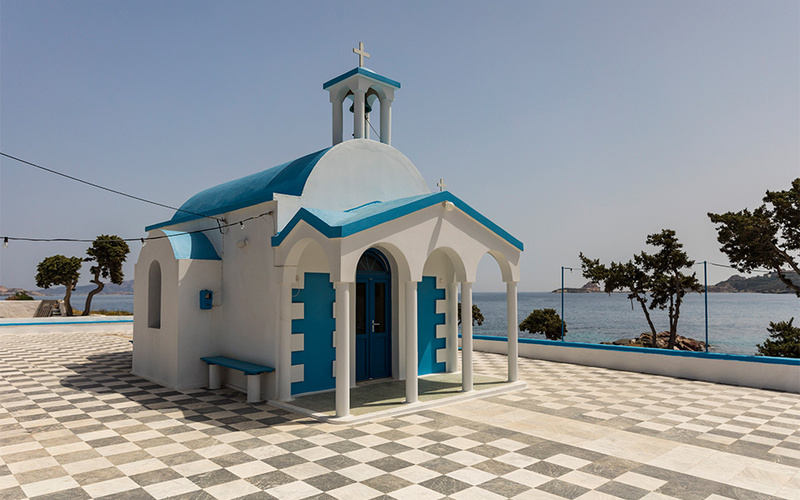 It is also said that the locals kept them brightly colored in open defiance of an order issued by the dictator Ioannis Metaxas (1936-1941) that stipulated that all homes on the island be repainted blue and white. You will see syrmata in traditional settlements such as Fyropotamos, Klima and Mandrakia. At sunset they become small, romantic paradises. 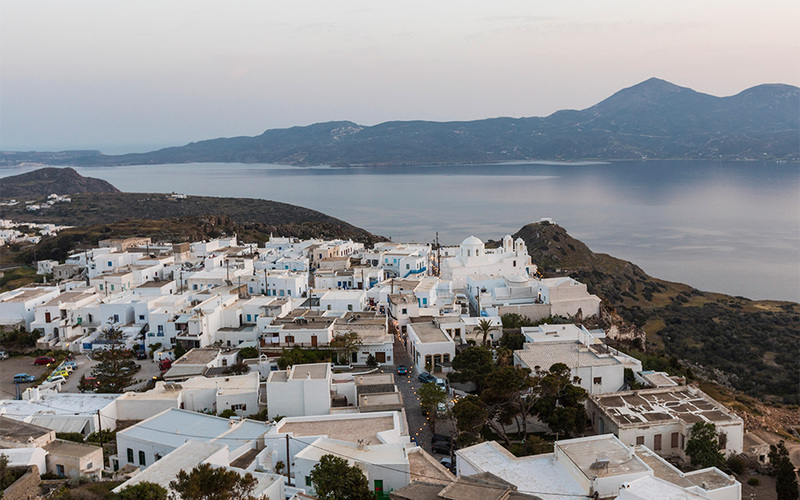 The highly active mayor of Milos, Gerasimos Damoulakis does not reject the oft-repeated description of Milos as the “island for couples”. But he adds that it is also visited by many families in search of relaxed holidays. He and the municipal board – the majority of whom are active in the tourism industry – have succeeded in growing tourism on the island by 40-50% over the past five years, with the biggest markets being France and Italy. There are also efforts to promote Milos among Asian travelers. So far, the development has been gradual and low-key. 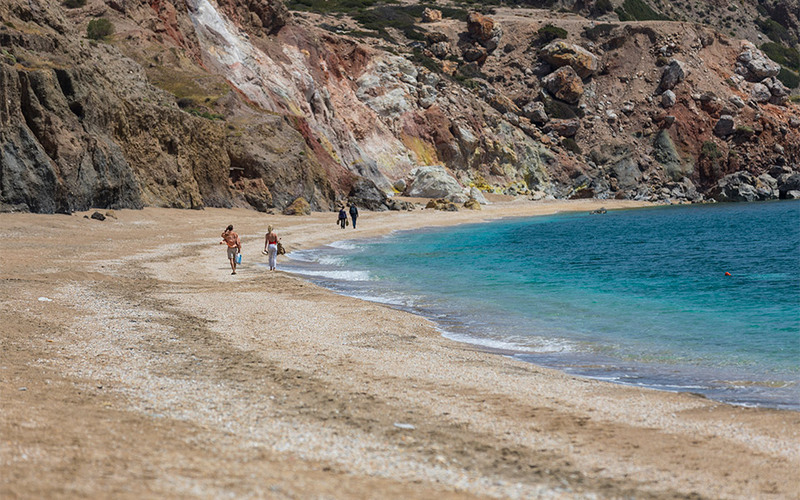 Tourism never exploded on Milos, as mining has long been the main source of wealth on the island. Even today, more than half of Milos’ permanent inhabitants live off the mines. “When I was a child, in the 1970s, I remember a few foreign backpackers coming to the island. Mr Thanasis who had a greengrocers, when he would see them passing by his shop, would cut them a slice of watermelon and feed it to them. That was as far as tourism went, no one dared to invest – they didn’t think that it could also be a source of income,” explains Mr Damoulakis, who is also President of the Committee for Tourism Development of the Central Union of Municipalities of Greece (KEDE). 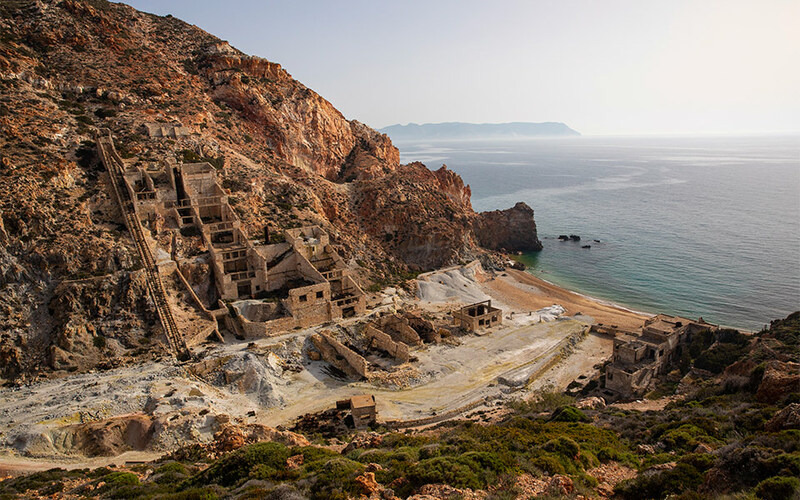 Mining has been important for Milos since antiquity. 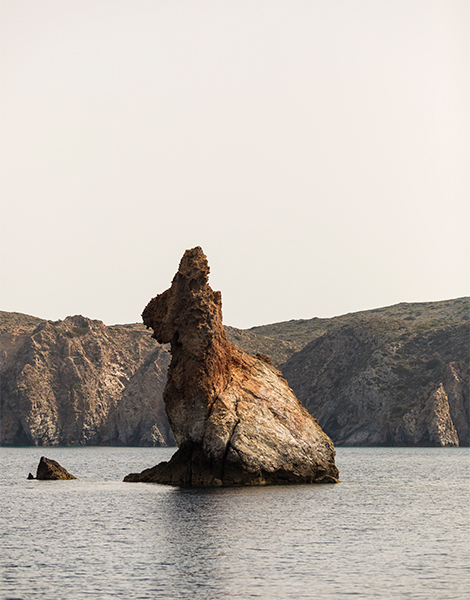 Does that justify all that has been done to Milos’ landscape over the centuries? 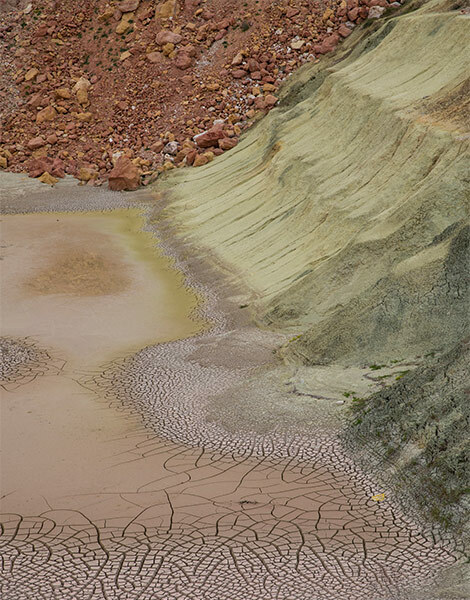 A few kilometers from “civilization” you will see enormous holes in the ground cutting through rock layers of different colors and in which workers and their bulldozers look like beach toys. Elsewhere you will see the so-called “artificial mountains”. I am shown one of the latter by my tour guide to the “other Milos”, Giorgos Petrakis, an agronomist and the man in charge of the rehabilitation of the mines on Milos operated by Imerys, one of the biggest mining companies in the world. His job, as he describes it, is to bring nature back to the mines. What exactly happens? The waste – that is the solid material that cannot be sold is placed on the ground and then “greened” according to the following process: In order for the loose rock to “bind” with the natural landscape and not be washed away by the first rains, it is seeded first with microorganisms and then small annual plants, after which native trees and perennial plants from the company’s nursery are planted. The process takes just five years, and in the end the final result is impossible to distinguish from a natural hill. A church in Pollonia, Milos. Plaka: After a stroll in the stone-paved alleys in the capital of Milos, take in one of the prettiest sunsets from Plaka, either from the courtyard of the church of Panaghia Korfiatissa, or from the Venetian castle and the Church of the Dormition of the Virgin which is found at the highest point of the village. Pollonia: At this fishing village, built around a small bay, enjoy a walk on the waterfront and coffee or food by the water’s edges. The ancient theater looking over the bay of Milos. 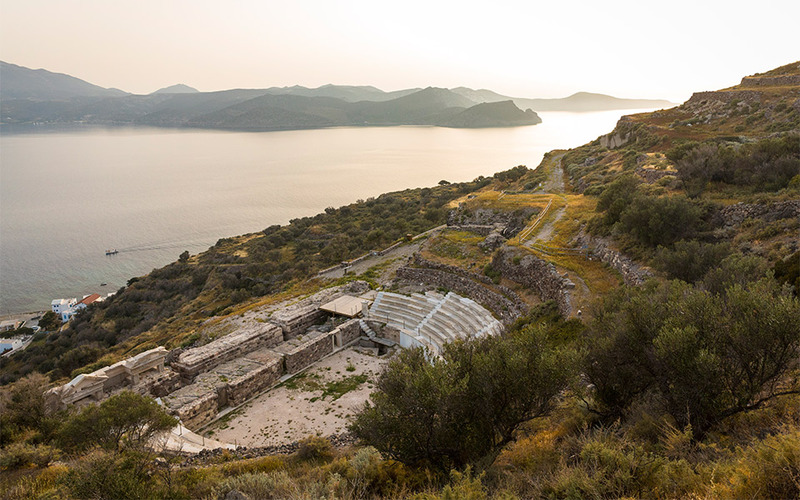 Roman Theater: An alternative place to visit at sunset, this ancient theater is situated away from the island’s settlements, on a slope surrounded by olive trees and shrubs and with a view of the bay of Milos. Insider the early Christian catacombs carved out of the soft rock on Milos. Paleo-Christian Catacombs: You can see “graffiti” dating from throughout the ages and up until the 1940s in this important early Christian monument. Known locally as the “big cave” this site was long unprotected, and dozens of travelers through the ages carved their names into the walls. 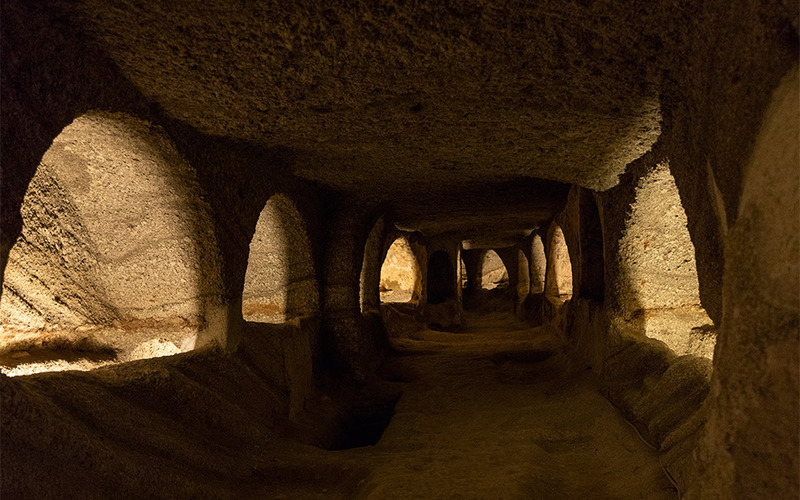 The oldest inscription is probably that dating to the 2nd century AD which names the members of the family that are buried in one of the 126 tombs carved out of the soft, volcanic rock. Visit the organized beach of Fyriplaka with fine white sand and turquoise waters, and impressive cliffs that change color (from pink to neon yellow) every few meters. Take a towel and an umbrella and drive to the “Seychelles of Milos”: three remote beaches with fine, silvery sand known as Triades. On the non-organized Alogomandra, with its turquoise waters, the waves have eroded the rock face to create an arch which provides shade. Take a mask and snorkel to the wide expanse of Aghia Kyriaki, to see the underwater sand dunes; then sun bathe on the loungers. For a final dip before getting on the ferry or plane, very close to Adamantas and the airport is Achivadolimni, one of the largest beaches on the island, which has sun loungers and umbrellas, a beach bar and watersports. You can fly to Milos from Athens in 45 minutes, with flights leaving daily (ΑΕGEAN, Sky, Olympic, Ellinair, Ryanair and Astra, from 85 euros for a one-way ticket), and with a high-speed or conventional ferry from Piraeus (from 38 euros, 3-7 hours travel time). Tsakanos Rooms (Adamantas, Zefyria, tel. +30 22870-21963). Pretty and comfortable rooms with minimalist decor, where each day begins with a different breakfast made with local products delivered to your door. From 140 euros for a double room with breakfast. Tania (Pelekouda, Pollonia, tel. +30 22870-41062, 6972-274141). A luxurious complex with suites over the sea, for the romantic. From 175 euros for a double room with breakfast. Vourakis Studios (Pollonia, tel. +30 22870-41111). Fully equipped rooms to rent with a view of the sea. From 70 euros for a double. Navagio (Adamantas, tel. +30 22870-24124). Exceptional seafood right next to the sea. Alevromylos (Parasporos, tel. +30 22870-23117). Cycladic cuisine. Try the goat cooked with tomato juice in a wood-fired oven. O! Hamos (Adamantas, tel. +30 22870-21672) A friendly taverna with local dishes in a cool, green courtyard. Gialos (Pollonia, tel. +30 22870-41043). Mediterranean dishes served on tables under tamarisk trees. Bariello (Trypiti, tel. +30 6984-218360). You will be greeted by the owner, Takis Loukakis, who cooks wonderful dishes with a twist using meat from animals raised on his own farm, and other delicacies. Right by the sea. Rent a conventional car or 4×4 from Milos Rent (tel. +30 22870-41473).